The Refrigerant Liquid Pump is a commercial / industrial grade pump used to transfer all class I, II, III, and IV refrigerant at rates up to 20GPM. 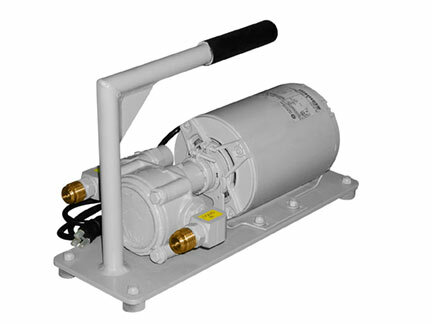 The Refrigerant Liquid Pump standard model has 3/4" male flare connections with quick-connects as an option. Installation of the oil recovery system shall be in accordance with all state and local, mechanical and electrical codes. Power requirements 110/115V 50/60Hz 1Ph .75Hp 15Amp, 220/230V 50/60Hz 1Ph .75Hp 15Amp. Filter Rack Cart: Single shell 192-Cu Inch, and Dual shell 384-Cu inch with 3/4" flare or quick connects. 3/4" hoses 10ft and 20ft.